This is a super easy, comforting side dish, perfect for all those zucchini and tomatoes over-flowing your garden! I adapted the recipe from Melissa’s Southern Style Kitchen, she used halved zucchini with Gouda cheese, I sliced mine and used Mozzarella. There are endless ways you can make this dish but the spices in the recipe below really hit the spot with me! You could easily add your favorite cooked protein to the layers to create a complete meal, this particular recipe would be great with a spicy Italian sausage. Pre-heat the oven to 350°F and spray an 8×8 glass dish with cooking spray or lightly grease with butter/oil. Place the tomato slices on a paper towel and sprinkle lightly with salt. Gently press another paper towel on top and allow to sit while you prepare the rest of the ingredients. Slice the zucchini lengthwise into ¼” slices to yield 5-6 per zucchini. Mix 2 Tbsp melted ghee/oil with the garlic salt, onion powder, dry Italian seasoning and black pepper. Place one layer of zucchini in the bottom of the casserole dish. Brush the tops of the zucchini lightly with the seasoned ghee/oil. Place a layer of tomatoes on top of the zucchini. Sprinkle with ½ of the mozzarella cheese. Repeat the layers of zucchini (brushed with seasoned ghee/oil), tomato and remaining mozzarella cheese. Toss the panko breadcrumbs, dry basil and grated Parmesan cheese with the remaining 1 Tbsp of ghee/oil and sprinkle over the mozzarella cheese, lightly pressing down. Bake for 30 minutes or until fork tender. Who doesn’t love a healthy grab-n-go breakfast? This is a super easy make ahead recipe that is perfect for those mornings when you are racing out the door but don’t want to skip a healthy breakfast. One or two of these muffins heated in the microwave and you’ve got a tummy-warming oatmeal breakfast without the mess! Feel free to customize these to your liking, sub out the chocolate chips for raisins or dried cranberries, add a dash of cinnamon or use pumpkin in place of the banana…the options are endless. Preheat oven to 375º F. Line 24 muffin cups with silicone liners. In a large mixing bowl, combine oats, salt and mini chocolate chips. In a separate bowl whisk together mashed banana, sweetener, water, oil and vanilla. Mix wet ingredients into dry ingredients, combine thoroughly. Divide evenly into muffin cups. 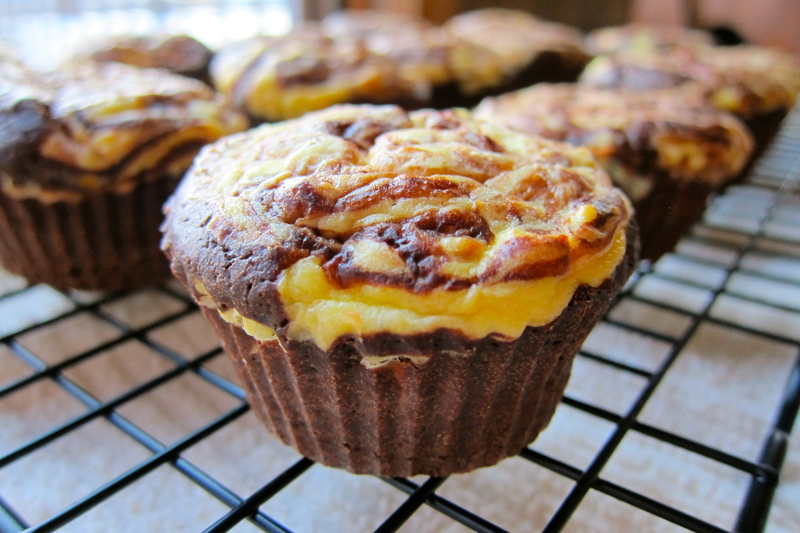 These don’t rise so a heaping 1/4 cup of batter is enough to fill the muffin cup without running over. Bake for 20 minutes, rotating pans 180º after 10 minutes. Remove from oven and cool on wire racks. Freeze in airtight container or plastic freezer bags. Irish Eyes are definitely smiling for this treat! Preheat oven to 350º F. Line cupcake tin with 12 silicone or paper liners. In a small bowl, toss the chocolate chips with the 3/4 teaspoon flour to coat, set aside. In a large bowl, with a hand mixer combine cream cheese and butter. Add sugars and vanilla; mix until well blended and smooth. Add eggs and mix until well incorporated. With mixer on low add dry ingredients and liqueur alternately to the wet mixture, beginning and ending with the dry ingredients. Gently fold in chocolate chips. Batter will be very thick. Using an ice cream scoop, divide the batter evenly between the 12 cupcake liners. Bake cupcakes about 20-22 minutes or until the centers are set. 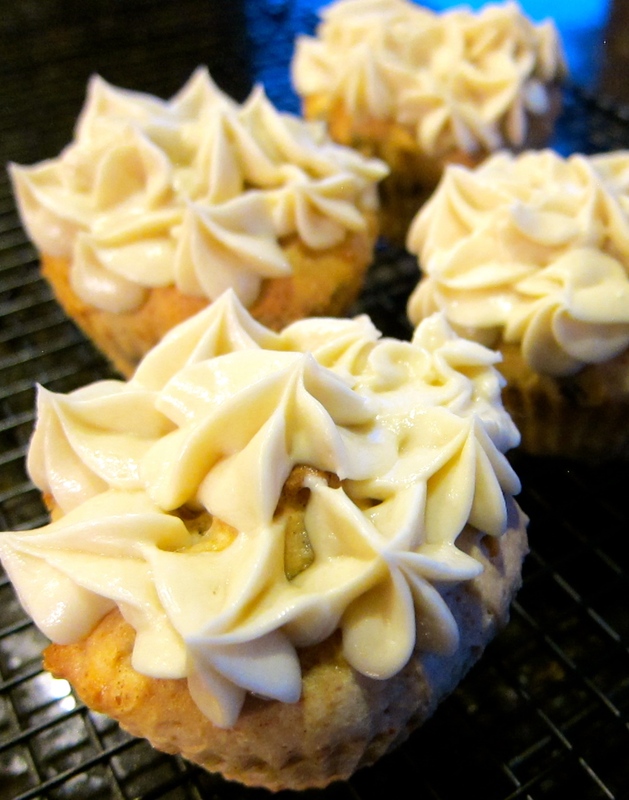 To make Buttercream: Blend all ingredients with an electric mixer until smooth and creamy. Transfer to a pastry bag with decorative tip and store in the refrigerator until ready to frost. Grease a 15-inch pizza pan. Prepare the brownie mix according to package directions. Spread into the prepared pan. Bake for 20 minutes, or until done. Remove from the oven and cool completely on a wire rack. Beat the cream cheese, pineapple, and sweetener together in a bowl. Use the reserved pineapple juice, if needed, to soften the mixture to a good spreading consistency. Spread the mixture over the cooled brownie crust. Arrange the banana and strawberry slices over the cream cheese mixture. Sprinkle with the chopped nuts and drizzle with chocolate syrup. 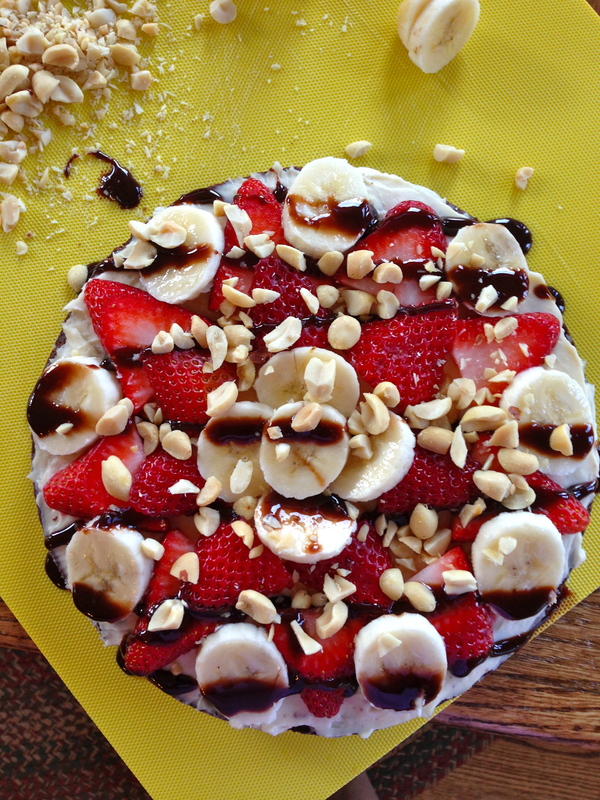 To serve, slice as you would a pizza, add a dollop of fresh whipped cream and sprinkle with chocolate shavings. 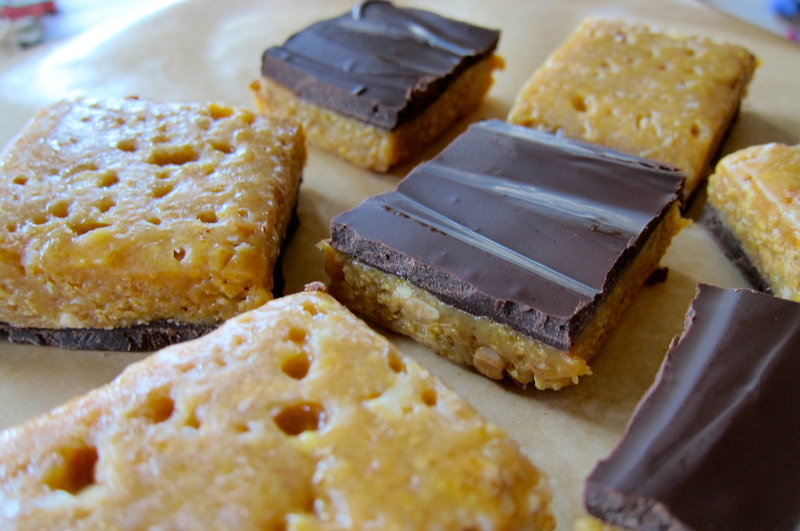 Peanut Butter Chocolate Bars have been around for ages…this recipe is actually adapted from a recipe for Peanut Butter Balls that has been passed down from my great-grandmother. Most recipes call for graham cracker crumbs or rice crispy cereal but I like the crunch that the corn flakes add in this recipe, for an extra crispy texture I use crunchy peanut butter too. I decided to make them into squares and add the layer of chocolate but they are equally good plain as bars, squares or balls! Grease an 8×8 baking dish with butter. In a large mixing bowl, measure 3 cups corn flakes, crush the corn flakes with your hands until fine. Add 1/8 tsp. salt and mix, set aside. In a small saucepan bring the sugar and corn syrup to a boil and then quickly remove from heat. Stir in vanilla, butter and peanut butter until smooth and creamy. Pour peanut butter mixture into the corn flakes and stir to combine. Press into the greased baking dish using a rubber spatula or a piece of waxed paper. Melt the chocolate in the microwave or on the stove. Pour over the peanut butter and corn flake mixture and spread evenly to the edges with an offset spatula. Place the dish in the refrigerator until set. Once the squares are set loosen the sides with a metal spatula taking care not to break the chocolate topping. Turn the square out onto a sheet of waxed paper, chocolate side down. Using a sharp knife cut the candy into 16 squares. I like to serve the squares on a platter with some turned chocolate side up and some peanut butter side up…they will get softer at room temperature so keep them in the fridge until ready to serve. We like them best at room temp. 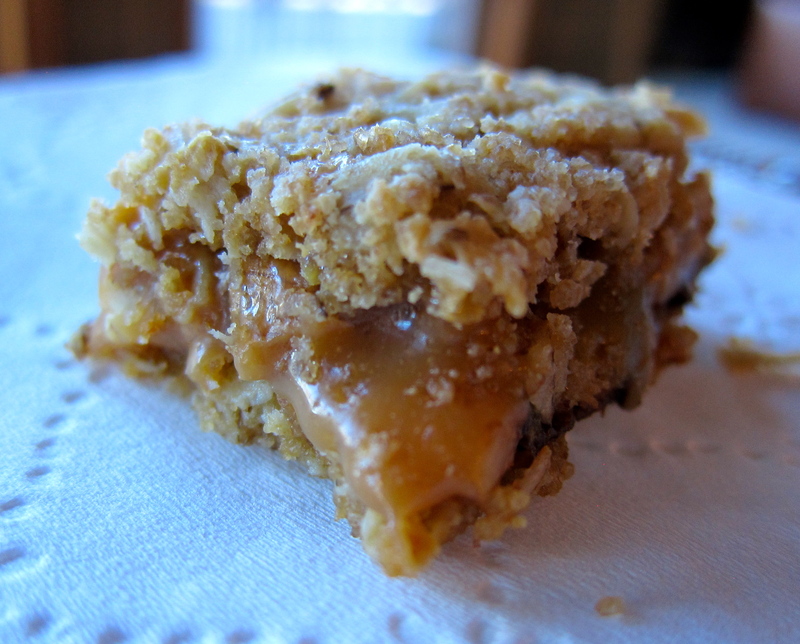 Caramel and Chocolate and Oats…OH MY! Here it is the middle of January and those cute little individually wrapped caramels are still begging to be used, transformed into a yummy decadent dessert. I simply had to oblige. 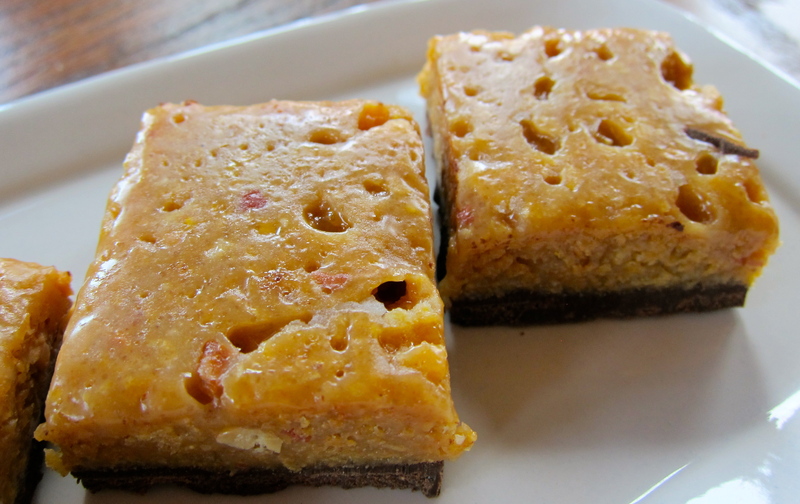 These kind of remind me of a Magic Cookie Bar in texture and richness…they really pack a sweet punch but have the buttery caramel flavor instead of coconut. This recipe uses store-bought caramels but you could sub in homemade caramel or a jarred caramel sauce. It also calls for heavy cream and butter but you could sub in coconut milk and coconut oil respectively 1:1. If you are not gluten-free then regular all-purpose flour and any type of rolled oats can be used, I used Cup 4 Cup Gluten Free Flour and Bob’s Red Mill Gluten Free Rolled Oats. Preheat oven to 350° F. Grease an 8×8 glass baking dish and line with parchment paper, leave a few inches hanging over the sides for easier removal. In a medium sauce pan, over low heat, melt together the caramels and heavy cream, stirring occasionally until smooth. You could also use the microwave to do this! In a separate bowl, stir together the flour, oats, brown sugar, baking soda and salt. Stir in the melted butter until well combined. Press half of the oat mixture firmly into the bottom of the prepared pan. Set the other half of the mixture aside. Bake the cookie crust for about 8 minutes. Remove and while still warm sprinkle the crust with chocolate chips and pecans. Pour the melted caramel over the chocolate and pecans and spread evenly, not all the way to the sides if possible (usually not though!). 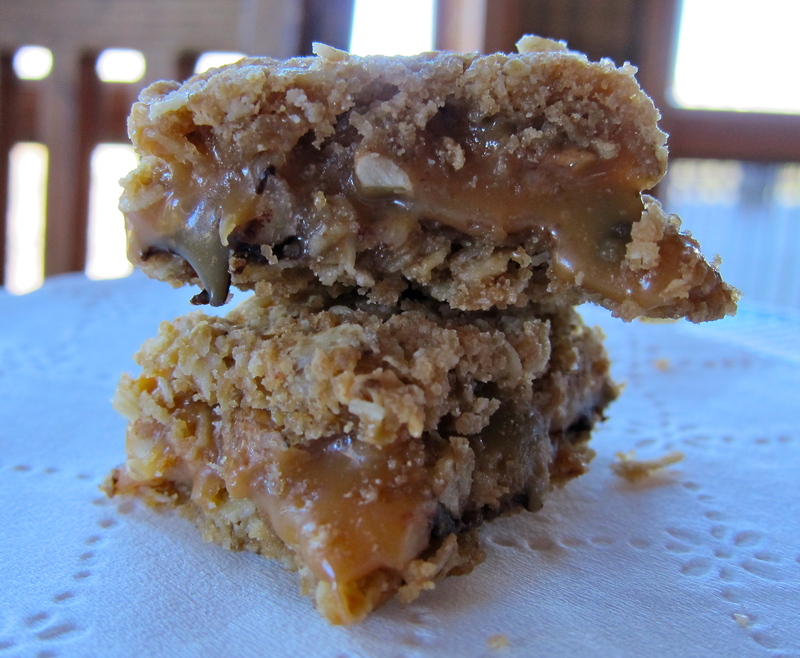 Sprinkle the remaining oat mixture over the top of the caramel and press lightly into the warm caramel. Return the pan to the oven and bake an additional 12-16 minutes, or until the top is lightly toasty brown. Remove to a wire rack to cool COMPLETELY. Yes, this means completely…about 2 hours on the cooling rack. Loosen the sides without the parchment paper with a sharp knife, gently lift the entire square out onto a cutting board. Using a large sharp knife cut into 24 cookie bars. Store in an airtight container in the refrigerator…they are perfectly fine at room temperature but we found the texture to be better out of the fridge! Small, but super rich and delicious! 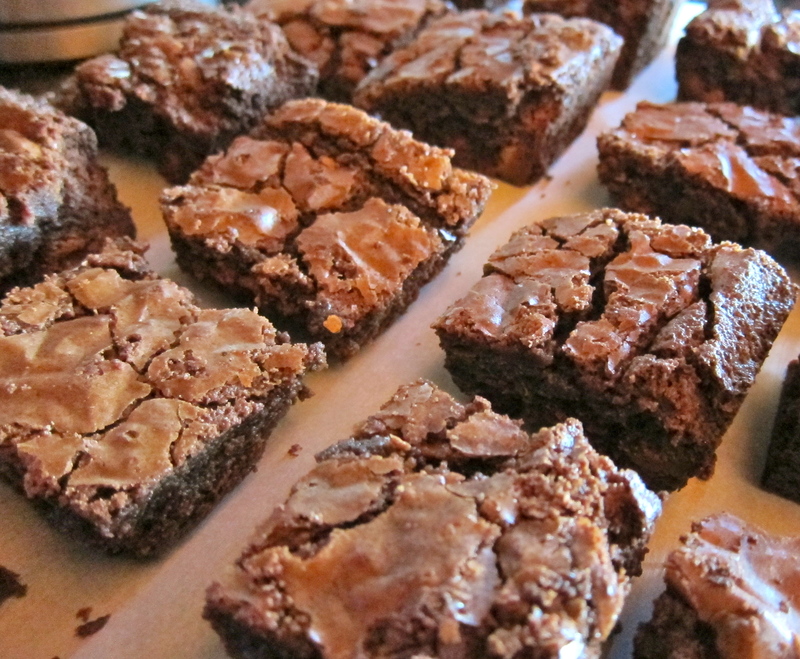 Anybody who has ever baked a pan of brownies from scratch knows that they can be tricky…under cook them and they are too gooey, over cook them and they are dry and crumbly and the edges are hard as bricks…it takes practice to get them just right. Anybody who has ever baked a pan of gluten-free brownies from scratch has probably thrown more than one batch in the trash. Well…I have to admit I’ve thrown more than one in trash, probably even more than ten. Yikes. Not only is it disappointing to not get it right or to not get the reward of a delicious chewy brownie after the labor but gluten-free ingredients ain’t cheap!!!! I came across a recipe in Food and Wine Magazine last month that I just had to try…Oh boy, am I glad I did!!!! 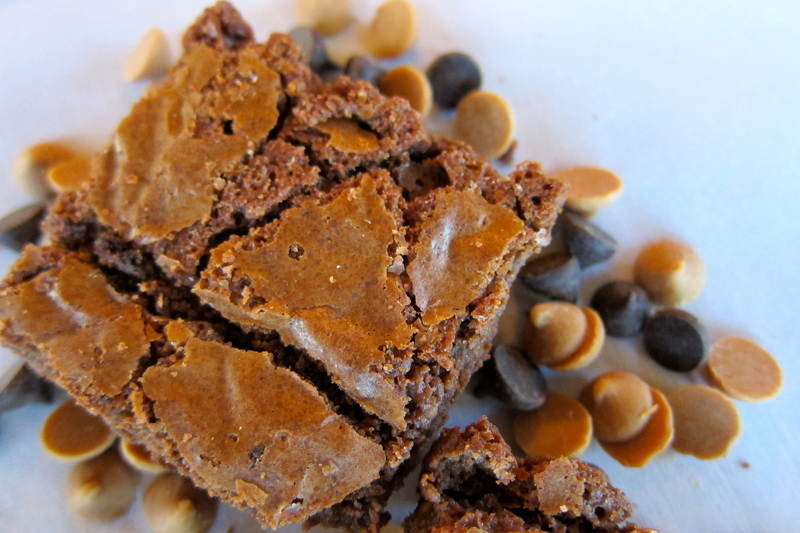 These brownies came out just about perfect…I live at high altitude so next time I may try a few adjustments but I think the recipe is definitely a keeper. I typically don’t bake with a lot of sugar so these will be reserved for special occasions because they are SUPER RICH and SUPER SWEET!!! 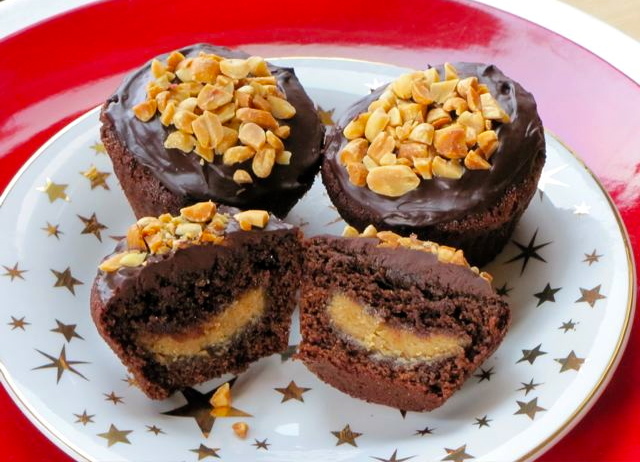 This recipe comes from Tully Phillips of Tu-Lu’s Bakery in New York City and Dallas…I can’t wait to visit them in person!!! Preheat the oven to 350°. Lightly grease a 9-by-13-inch metal baking pan. Place the 3 sticks of butter in a heat-proof bowl and set the bowl over a saucepan of simmering water (the bottom of the bowl should not touch the water). Melt the butter, stirring occasionally. Add the chopped chocolate and stir until melted. Remove the bowl from the heat. In a small bowl, whisk the rice flour with the tapioca flour and salt. In a large bowl, whisk the eggs with the sugar and vanilla until blended. Fold in the dry ingredients until incorporated, then fold in the peanut butter chips and chocolate chips. Fold in the melted chocolate mixture. Scrape the batter into the prepared dish. Bake for about 1 hour and 15 minutes, until the brownies are slightly puffed and a tester inserted in the center of the brownies comes out with a few moist crumbs attached. Transfer the pan to a rack and let cool completely before turning out the brownies and cutting them into bars. The brownies can be stored in an airtight container at room temperature for 3 days, or wrapped in foil and frozen for up to 1 month. 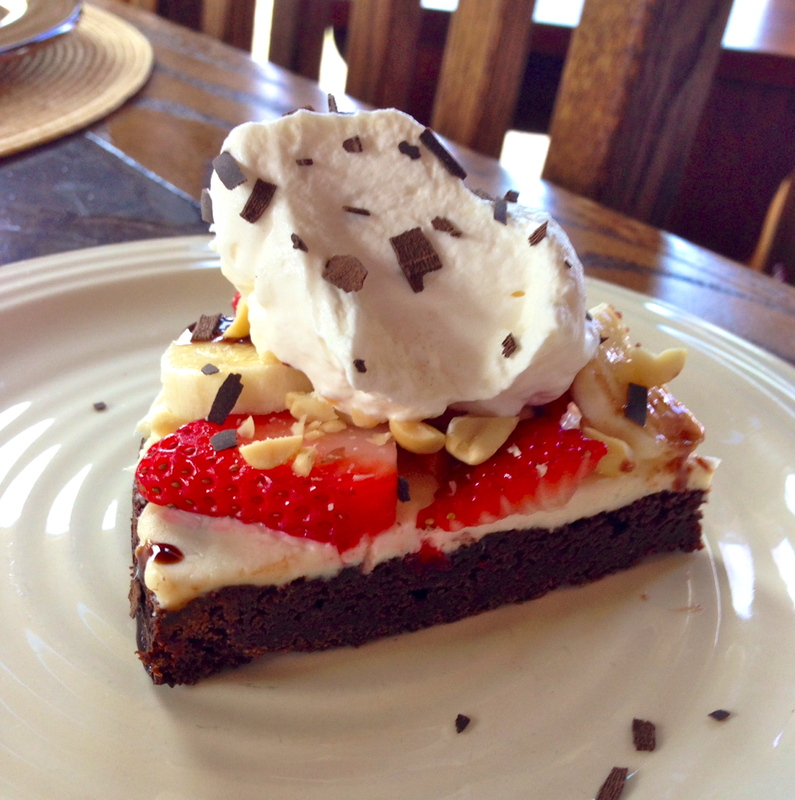 I LOVE brownies and I LOVE cheesecake…putting the two together is absolute heaven. These little gems are SO tasty and fairly easy to make. I have made them with both regular sugar and Swerve (erythritol) and they have turned out great both ways. They also work nicely in a mini-muffin cup for an even smaller bite-sized treat. I have not tried them in anything but the silicone liners though so I’m not sure how they’d do in a paper liner…I think they have enough fat in them that they would slip right out but I can’t say for sure. I hope you enjoy them as much as I did! Preheat oven to 350° F and set 16 silicone muffin cups on a large baking sheet. For the cheesecake layer, in a large bowl, beat cream cheese and powdered erythritol (or sugar) until smooth. Beat in egg until well combined. Add orange zest and orange flavor extract and beat until smooth and well mixed. Set aside. For the brownie layer, in a medium sauce pan, melt butter and coconut oil over low heat, add cocoa powder and stir until smooth. Stir in erythritol (or sugar) and vanilla extract. Let cool 10 minutes. Beat in eggs, one at a time, until well combined. Spoon 2 Tbsp. of brownie batter into the bottom of each muffin cup. Spoon 1 Tbsp. cheesecake mixture over top and use a toothpick to swirl layers together, bringing some of the brownie mixture to the surface. Bake 20 minutes, or until sides are set and the middle is just barely jiggling. Remove from oven and let cool 20 minutes, then refrigerate until set, about 2 hours. This recipe is an adapted from All Day I Dream About Food’s Raspberry Cheesecake Swirl Brownies. 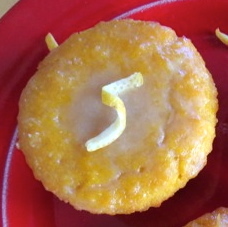 Preheat oven to 350° F. Line 9 muffin cups with paper or silicone liners. For the cupcakes, in a large bowl, combine the almond flour, coconut flour, cocoa powder, salt and baking soda. In a separate medium bowl, whisk together the eggs, oil and maple syrup. Blend the wet ingredients into the dry ingredients with a handheld mixer until thoroughly combined. For the filling, in a small bowl combine the peanut butter, maple syrup, vanilla and salt and stir until smooth. 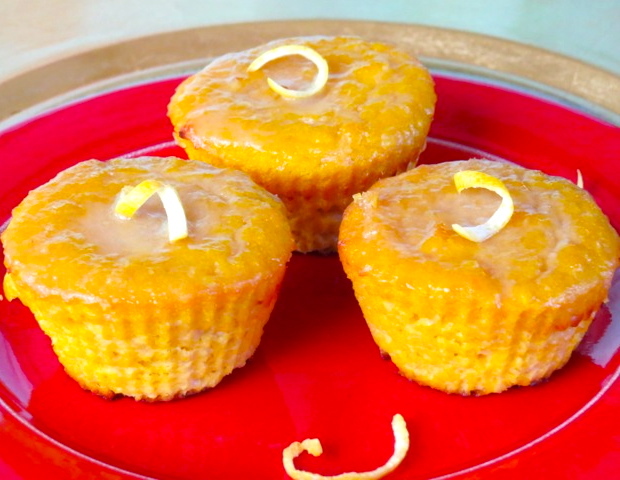 To assemble, spoon one tablespoon of the cupcake batter into the bottom of each muffin cup. Next, spoon one tablespoon of filling into each muffin cup. 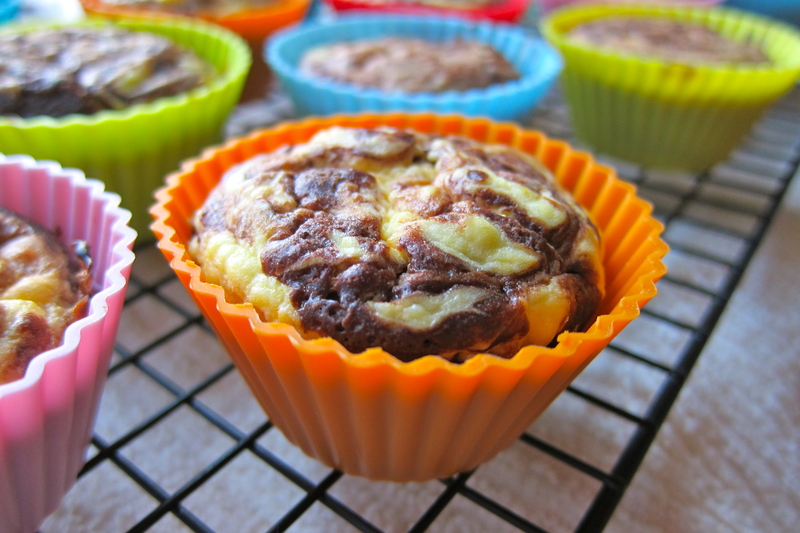 Divide the remaining batter evenly between the muffin cups covering the filling completely. Bake for 20-22 minutes or until a toothpick inserted about 1/2″ from the edge of the cupcake (to avoid the filling) comes out with only a few moist crumbs. Remove from oven and let the cupcakes cool in the pan for 1 hour, then frost with ganache and top with chopped nuts. Place the chocolate in a medium bowl and set aside. In a small sauce pan, bring the heavy cream to a boil and immediately remove from heat. Pour over the chocolate and let sit for 5 minutes. Add the vanilla and salt and whisk together until smooth. Let the ganache cool to room temp and then place in the refrigerator to thicken, about 15 – 20 minutes. Store any leftover ganache in a glass container in the refrigerator for up to 3 days. I’m not sure what my problem is with lemon but…I just don’t like the sound of it in my food. I’m not saying that I don’t like the taste of it once it’s there but recipes like Lemon Bars, Lemon Pie, Lemon Dill Salmon, Lemon Chicken NEVER appeal to me…meaning I would never tear a recipe out of a magazine or order off a menu anything with lemon (or lime, for that matter!) in the title. Weird, I know. Especially since I enjoy the taste of pretty much each and every recipe I’ve encountered with those very ingredients! I rarely make anything lemon or lime either. This recipe is adapted from Kelly’s recipe for Lemon Bread at Primally Inspired. Preheat oven to 350° F. Line a muffin tin with 6 silicone muffin cups or grease the tin very well with coconut oil. In a small saucepan combine the ingredients for the glaze, bring to a simmer over medium-low heat. Simmer for 5 minutes, stirring constantly then remove from heat and allow to cool for 45-60 minutes. In a large bowl whisk together the eggs, coconut oil, almond milk and maple syrup. Stir in the coconut flour, baking soda and sea salt. Mix until well combined. Divide equally between the muffin liners, about 1/4 cup each. Bake for 20-22 minutes or until the tops are slightly golden and a toothpick inserted in the middle comes out clean. Allow the muffins to cool in the tin on a wire rack for about 30 minutes. Remove the muffins from the silicon cups or muffin tin and set on the wire rack, place a piece of parchment paper under the wire rack to catch the glaze drizzle. Drizzle the glaze over the muffins as desired and then place in the refrigerator to set the glaze for about 30 minutes.